SHAH ALAM, 20 JULY 2010: DiGi Telecommunications Sdn Bhd ("DiGi") will launch iPhone 4, the thinnest smartphone in the world with the highest resolution display ever built into a phone, in Malaysia in the coming months. To register your interest, please visit www.digi.com.my/iphone4. For more information on iPhone 4, please visitwww.apple.com/iphone. Established in 1995, DiGi is listed on Bursa Malaysia Securities Berhad and is part of the global telecommunications provider, Telenor Group. DiGi focuses on making it easy, keeping it relevant and providing the best deals to ensure excellent customer experience in mobile and internet services. Through its corporate initiative, Deep Green, DiGi is committed to a sustainable business that is financially and ecologically responsible to all stakeholders. Anyway, its just a register of interest on the iPhone 4. Very simple statement. After that, its time to go home. Guess what, when im back at home, i saw tweets from maxiscomms. Maxis have counter back! 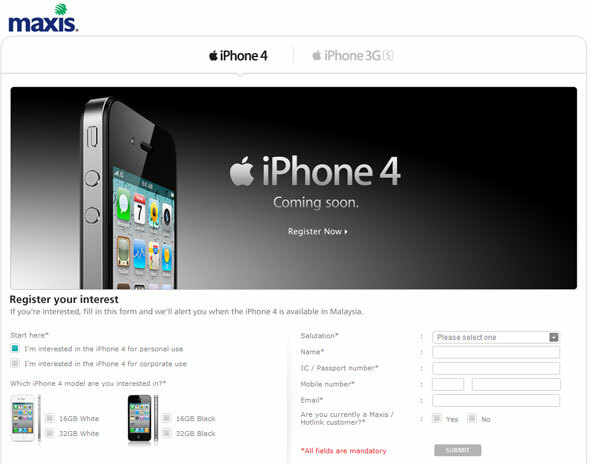 Maxis also launched their "register of interest" on iPhone 4. Actually, i thinks 1 month back, when i complaints on the Maxis network, i do received a call from maxis customer service to find out details on the complaints and normally when a CS come to end, they will ask you: Do you have any more question / inquiry that we may help you? 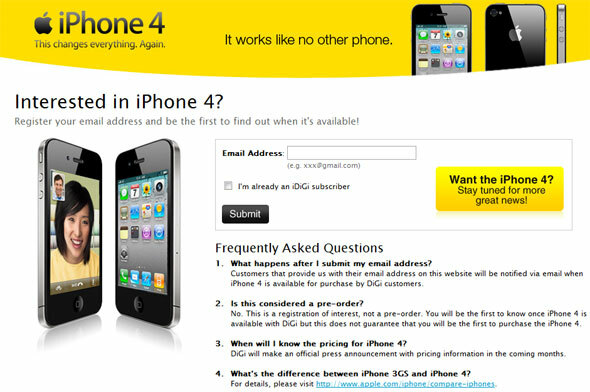 then i was sudden thought of iPhone 4.
so i asked on when do Maxis will intro iPhone 4? The CS then asked me back whether i have the intend to register for iPhone 4 interest. Then she asked my details. Maxis never made it to public. Anyways, since DiGi now have made the 1st mover, more and more interesting competitive going to happened in the coming weeks / months between Maxis and DiGi. I wonder, if DiGi never made the 1st move, how long would Maxis take to announce it.